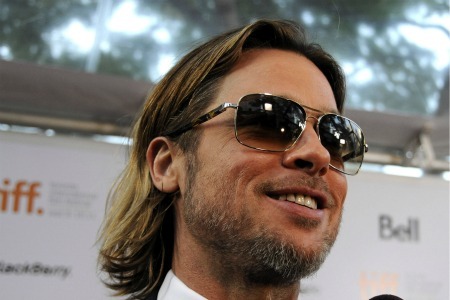 Notorious prankster Brad Pitt has found a worthy adversary in Moneyball co-star Jonah Hill. It was an all-out prank war on the set of their film, set to open Friday, and according to both Pitt and Hill, it got pretty intense. Brad Pitt and Jonah Hill staged an all-out prank war on the set of their latest film, Moneyball, and no one and nothing was safe from their wrath. So Hill did what any straight up guy who’s been attacked would do, he fought back! Pitt has a notorious reputation for being a prankster. At the Toronto Film Festival, where the two were discussing the film, instead of talking about working together, they made fart jokes in front of the media. Hill would say, “Brad’s chair is squeaking.” Pitt’s reply, “It’s not my chair.” Laughter ensued.